This post is in no way written to influence anyone's decision to vaccinate - it is a very personal decision, that should be an informed choice. I am not in the medical industry, and have no medical knowledge. The below is ALL my personal opinion. I merely write this to balance everything I am currently reading online. I have written about vaccinations on two previous ocassions. The first time here and the second time here. I would say that this post below is the one I have done the most research for. However the time I did THE MOST research was back in 2010, when I actually made my personal decision for my child. Back then I also watched all of the You Tube videos available on the subject which I have not done this time. What saddens me is that a lot of people think that anyone who chooses not to vaccinate does so because of Andrew Wakefield, and therefore naturally thinks they should reverse their decision in light of him having being struck off and in light of The Lancet retracting his publication. In fact when I posed my concerns RE: vaccinations with my Health Visitor it was he, and only he that she wanted to discuss. The wider subject is met with a change of subject. If people who think that, did as much research as anti-vaxers, they would know, that this is far from the beginning and end of the story. Instead of saying "vaccinations don't cause autism" and closing down the conversation there, how about reading up on vaccine injury. How about reading up on the contra-indicators that may mean vaccinating your child could be harmful. Read the "Treatment" section here, regarding >> Vitamin A and how it can assist with lowering rates of mortality. 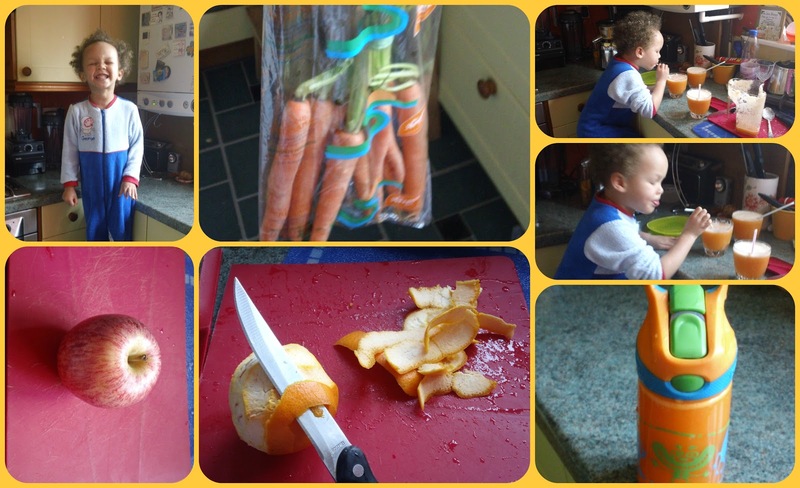 Knowing that, I ensure that Aaron and I juice really often, and his juice ALWAYS contains a few carrots (as he does not eat them) as an easy and tasty way of giving him a dose of vitamin A. His body loves nutrition and as he doesn't consume toxins like alchohol, caffeine or sugar in high quantities, he is still sensitive to listen to his body signals, i.e. he craves broccoli when he needs it, and literally won't touch it when he doesn't. He also takes HalibOrange Baby & Toddler Multivitamin Liquid nearly every day, and it is he that gets it from the fridge, again because he knows when his body needs it. Given we are in a country with good nutrition and sanitation I do not panic on the odd day he or I forget him having it. The Germans considered the risks too high in light of the fact that deaths and disease severity had decreased without any reference to a vaccine. * THE SAME IS TRUE OF NEW ZEALAND, but parents are not told that. << Reading that will also inform you as to the "Yellow Card" adverse drug reaction reporting scheme which I think as parents we have a duty to know about. It was started by Bill Inman and pages 10 and 11 <<< here give you some great info as to where he is coming from and also takes you back to the 1960s and 1970s to previous scares like problems with THE PILL. Incidentally, there WAS an outbreak of chickenpox in Aaron's nursery a few weeks ago. A couple of times during that time, he got me to scratch his back, and as MY chickenpox when I was little began with one spot on the back, each time I thought right, THIS is it, but you know what, he might have incubated it, but he did not contract it (touch wood), and I am ready to look after him if he does. The decision to vaccinate is an important one. You have to educate and inform yourself and then make a decision that you can live with and feel comfortable with. I cannot follow the herd or what the media spouts out, as I can't unknow the knowledge I have. I also can't ignore the intuition I have. Whichever choice you make, make sure you listen to your inner whisperer and that of your child's. If you do THAT, truly do THAT, you can't go wrong. Whichever decision you make, it'll weigh heavy. They both come with weight and with pressures. Choose wisely, choose authentically, and be ready to face the consequences. Remember WE did not undergo the length depth and breadth of the current vaccination schedule personally, unless you were born in the 80s? So, we can't even say "hey son, I went through it and I'm fine". I spoke to my Mum this afternoon and I told her about the outbreak of measles in Wales. She is from the generation that caught measles and looked after their child accordingly. To her mind, it was a condition you nursed, not vaccinated against, like chickenpox. I told her that people who have complications usually have underlying health conditions and she practically told me, in not so many words: "what did you tell me that for?". I explained that my generation of parents appear to need to be told that, and she said, not so, for her generation. She went on to tell me about Ireland and how most people refused to get the Swine Flu vaccinations once they found out what the ingredients were. Anyway I will leave it there. Oh, the ONLY other thing I want to say is that I have TRIED to read up on the current South Wales epidemic but someone somewhere must have made a press release as it doesn't matter where I go, it is the same stats and sentences I am reading everywhere. I want to know if children who have had their vaccine AND booster have still gone on to get measles anyway, but seems impossible to find out. Ah well, another media blackout where we are only given headlines. Despite me saying "I will leave it there" I am back today, thanks to knowing MORE as a result of an informative discussion on mumsnet. Thank you for linking me in and being respectful of my decision to vaccinate The Boy. I know we have viewpoints from either end of the spectrum and yet still manage to understand the point of view. My pleasure. I found your post factual, and professional given that it is such an emotive topic. It can only be a good thing to hear the other side out. We often learn from each other. Thank you for such a polite comment. If you are not trained to properly read medical studies then it is impossible to have an understanding of the statistics. The conclusions can always be manipulated but if you have access to the raw data this is the part that needs to be examined. The point you make about countries like Germany and NZ is worth consideration. However it is important to also consider that if a government lacks the resources to fund or chooses not to fund healthcare they are also capable of manipulating data to meet their own requirements. I do think that regardless of whether a person decides to vaccinate or not it is a parents job to research & try in as far as they are able to understand exactly what the risks are on both sides. For many, no thought is put into it at all. So I applaud you for attempting at least to find the data needed to come to a decision. When I was reading this comment I could not tell whether you were for or against my post. Glad it ended the way it did. It saddens me that (1) people often times don't fully look into it (in addition to web articles there are books on the subject) and (2) the media and government would appear to be in the pockets of big pharma. Anyway thank you for visiting and leaving such a comprehensive comment. It is completely disingenuous to link to a German text from 1980. In Germany, the MMR (usually Priorix) is recommended at 11-14 months (first MMR) and 15 to 24 months (second MMR) and vaccination rates are a) high and b) still increasing. What was stopped in about 1977 was the use of single measles vaccine (and from that time, the MMR was used). You open your post with this - This post is in no way written to influence anyone's decision to vaccinate - it is a very personal decision, that should be an informed choice. - which states your position - honest and a mum attempting the best for her son in a seemingly skewed media circus. It's only a few years ago that they were lacing the vaccinations in mercury before injecting that into babies bodies. The World Health Organization states quite categorically that mercury is a poison and should not even be used to fill teeth. The UK defy this advice still today. And it is the poison that they lace vaccinations with that is said to generate the reaction from the body rather than the disease itself. To be unsure about it, is enough to not do it, Liska. Good for you for speaking out. Ah yes the 'blame Andy Wakefield' argument for anyone who chooses not to vaccinate their child. It's a sort of odd argument anyway considering Andrew Wakefield told people to continue to vaccinate, he just suggested using the - then freely available - singles as an alternative to MMR while more work was carried out. He also stated publically that his own children had been vaccinated with the MMR. But suggesting the use of singles was enough to be cast as the modern day bogeyman. For anyone interested in the autism-vaccine connection you won't find much published, but if you talk directly to the researchers (especially those working on immune system dysfunction, gut disorders and mitochondrial dysfunction) they'll happy discuss whether they think vaccinations could ever play a role, however small. It's a complicated picture reflecting the complexity of autisms (not a typo there are many types of autism). And what a pity David Salisbury was unable to tell us on the mumsnet chat how many affected in the current outbreak had been vaccinated with one or two doses of measles containing vaccine. I did read one report that said 25% of children affected had been vaccinated, but I have not seen any official figures so have no idea whether that's true. It sounded surprisingly high to me and it would have been helpful to have been given clarification on that point. Telling us that 'most' children were unvaccinated wasn't that helpful - it would have been very worrying indeed if that had not been the case. Thanks for your comment, and I also really wanted an answer to that question. I don't think we will get one though as it is not in their interests. Thanks for referring to my post & letting me know you had done so. I'm astonished at your implying that Public Health Wales are lying about the measles outbreak. As far as I'm aware the statistics are clear: vaccinations are down, measles cases are up. To imply that they're making up these figures is to accuse of criminal behaviour. Is that really what you think? I can't accept that the whole organisation is so psychopathically nasty. Your post however, as before, furnishes no scientific evidence for any of these claims against vaccines. The only 'evidence' proffered is subjective & circumstantial, to which you add conjecture & opinion. I would suggest that this is BECAUSE THERE IS NONE. You seem to ascribe this to conspiracies & cover-ups - which is, of course, a circular argument which can be used to justify anything. That's not enough for me. I live near Swansea, my twins start pre-school today & there could be infected children there. So I took no chances: we brought forward their 2nd jab 2 weeks ago. I think even you would agree that measles is highly contagious & can not only cause serious permanent disability but can also kill (W.H.O. : 158,000 deaths worldwide, link available). This is clear, established scientific evidence. There are no scientific studies that measles vaccines can be harmful on any kind of scale, that might pose a risk to the general population. If there are, please link to them. So we have proven risk of injury & death vs opinions & hints of dark global conspiracies - but no EVIDENCE. I need more than that if I'm to protect by children from possible permanent disability or even death. Also: I am NZ born & raised & have family & friends there. I will check your claim about their vaccination programme. I suspect the data you used, although you don't refer to any, is as flawed as your German example, as exposed by an earlier commenter here. Sorry, Liska: I need evidence, not conspiracy theories, before I take such a huge risk with my children's lives. But thank you for your post. It's good to have a debate about such an important issue. After weeks of panic in the media about a measles outbreak in Swansea, the Welsh Government now says it never happened, and no one died. It's never too late for governments to lie and cover up their mistakes. They claim it was faked. The Great Measles Epidemic of Wales—the one that’s being used to stampede sheeple into vaccine clinics for the MMR jab—never happened. Seriously! It was faked. The actual data from the Welsh government on cases of measles proves it. The news media have been chock-full of the “measles epidemic” in Wales, along with the young man whom it was claimed had died of it. He didn’t—and the epidemic never happened. The proof is in Wales’ own official statistics. The young man who died during the proclaimed measles epidemic, Gareth Colfer-Williams, did not die from measles. But even those few reports that admitted he didn’t die of the disease went on to a discourse of how terrible measles is and how the “epidemic” was so horrible. In the BBC article linked, we’re informed that “83 people have needed hospital treatment for the illness.” That, though, cannot be true. The fact is that, though 446 measles notifications were made between 1 January and 31 March of this year, those were merely reports. The reality is that only 26 cases were actually confirmed! You may have noted that this faux measles epidemic started in November, and the figures for last year weren’t included. However, that doesn’t help make the case for an epidemic, or even come close to the claim that 83 people had to be hospitalized for measles. You see, the total number of confirmed measles cases in Wales for all of 2012 was 14. So, adding 14 for all of 2012 to 26 for the first three months of this year, we get a total of 40 confirmed cases of measles—less than half the falsely reported 83 hospitalizations! Keep in mind that measles is a reportable disease. That means any doctor who suspects someone has measles must report it. It does not mean that the person has the measles. When a disease is considered reportable and there’s supposedly an epidemic going on, doctors aren’t taking any chances with their licenses to practice. They’re reporting anything that bears the slightest resemblance to measles. However, as is obvious here, it doesn’t mean that the doctors have any skill at diagnosing it. TAP - The MMR doesn't work. That's what they want hidden from view. Thank you for commenting and letting me and my readers know. Having chatted with you briefly on twitter I have to modify my initial paragraph about PHW & the Swansea measles epidemic. I thought you were questioning the statistics there whereas you in fact seem to want know more. So I will say instead that the facts that in Swansea there is a direct & rapid rise in measles cases - now 765 - as the vaccination rate has decreased surely shows that MMR prevents measles. Therefore isn't wanting to know what the measles infection rate of fully-vaccinated children moot? The NHS figure is that the 2 jabs, when the 2nd one becomes fully effective after 2 weeks, provide a 98% probability of immunity from measles. I categorically do NOT believe that 98% figure. In Ireland's outbreak 10% of the people with measles had had their MMR... Also, you only have to read cases of real Mums on both netmums and mumsnet (not talking Wales here) who say that their child had measles, yet it was not diagnosed as Measles as the Dr said it couldn't be, if they'd been vaccinated, so it instead is called mini-measles or "measles-like" symptoms, thus allowing your 98% figure to reign supreme. If they admitted it was measles they'd be obliged to report it, and the stats would be truer, and not so much in their favour. There are also Doctors in Wales, saying that for some, the rash, in Wales, is actually an all over body rash and not divided into measle like spots and may be a viral rash, but not actually measles itself, or it has mutated to avoid the vaccine? Anyway, I think, whether it is 2 years, 2 months, or 5 years or 10, the truth will come out at some point. I also read of a school in Wales where a whole class was off school with the measles, despite most of them having been fully vaccinated. Anyway, I don't think we'll ever agree, but I do appreciate your humouring of me on Twitter. I hope we are still in touch when there is more information available. I'm blogging about this at the moment, and I really don't understand the introductory sentence - "This post is in no way written to influence anyone's decision to vaccinate". If it isn't, why write it at all unless it's to justify your own stance? Why can't we all just do what we think it best for our children and leave it at that? Why this constant need to tell everyone else why, unless we really are trying to influence others? (1) because the people who are pro vaccine who I had encountered in the blogging world, thought the anti position was ONLY about Andrew Wakefield and in light of him being struck off and his report discredited they could not comprehend anyone being anti vaccine. This post was to show that there is more to the debate. There are vaccine injuries that go way beyond autism, and they are talked about in court cases, just not necessarily in the mainstream media. (2) the Wales epidemic is being used as a campaign to demand that everyone goes and gets the MMR. It is a media onslaught that is unrelenting (and they are now targeting London not just Wales). (3) Because of the point above, I didn't just want to be a passive listener I wanted to talk back by giving my standpoint. I couldn't keep hearing the same message HOURLY, without saying "but I think!" (5) People who don't agree, at least now know, (i) that there can be contra-indicators for getting vaccinated and (ii) there are vaccine injuries (which some people genuinely knew nothing of). The reason for the sentence, that you single out, is because people on the other side of the fence WANT people to get the MMR as a result of their blog posts, and I am NOT asking people to do the opposite. I think to do either of those things is to take a weight of medical responsibility that none of has have the right training or qualifications for. Neither does the Health Visitor who told me vaccines are no problem. Anyway, by 2018 the truth will be out there. I will be very interested to see what people think THEN.